Our philosophy is simple, if you can breathe consciously you can do yoga . Chair Yoga ​is a simple way to make the benefits of yoga accessible for people ​with limited mobility and working through various health issues. Chair yoga is a safe and effective way for seniors and people with limited mobility to relieve stress, stay active, improve mobility and maintain strength. 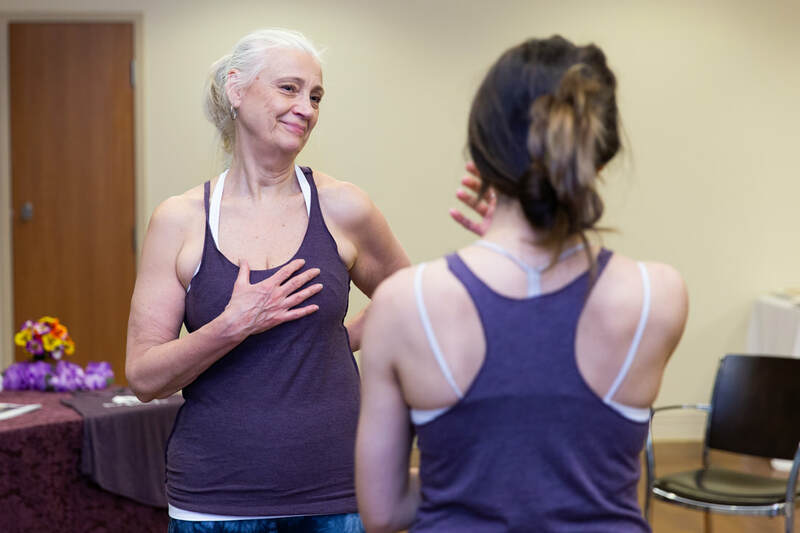 ​This intensive training seminar will give you the tools and techniques you can use to create meaningful and accessible group yoga classes for people with limited movement. Recreation Therapists, Yoga Teachers and Students, Activation Therapists, Physical Therapists, Personal Trainers, Group Fitness Instructors, Support Workers and people who work with individuals with limited mobility. A simple way to introduce mindful movement for groups with limited mobility. A unique style of modified yoga poses that are accessible for people in chairs AND wheelchairs. The ability to train deep breathing, strength, balance and mobility to people with unique physical challenges. A fun and empowering way to help individuals find relaxation and mental clarity. Contact us with any questions or concerns ! Complimentary coffee , tea and snacks throughout the day. Do I Need to Be a Yoga Instructor to Participate? No. You do not need to be a yoga instructor to participate! It is a bonus but not necessary. Will I get a CEU credit ? ​​To apply for continuing education credit, you should go through your agency to be granted approval. Contact me directly with any questions, info@smyoga.ca. To appear on our instructor locator page, you must demonstrate what you have learned by submitting follow up video materials. This ensures that you are able to put your knowledge into action. Submit 2 different class lesson plans and pass the written examination (you will receive both at seminar). Teach 8 Sessions of Chair Yoga to a group of people who would not normally have access to this style of class. Stay with the same group for 4 -8 weeks and film 15 minutes of the last class (specifically include teaching some postures, breathing and meditation ) . Submit corresponding lesson plan. Once you submit your demo teaching video within 3 months of the seminar, you are eligible to be listed as an instructor with us! Option 1 & 2 can be done together as well.